Y1 children used small story boards to re-tell a story to a group. 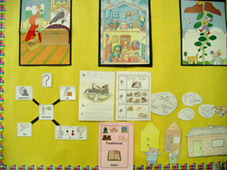 Children liked using the tabletop storyboards because the removable symbols helped them to physically sequence the story. 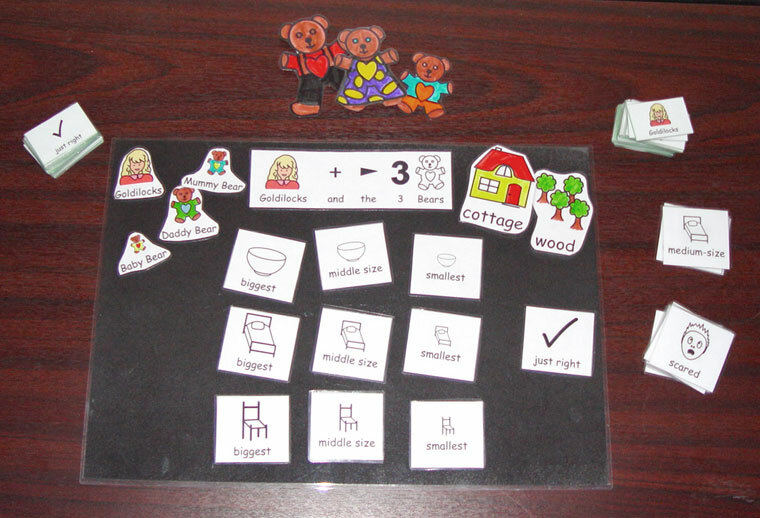 Some children who normally find recording stories difficult had their confidence boosted because they didn't have to rely totally on adult support and were able to use the symbol/word cards to aid recording the story. 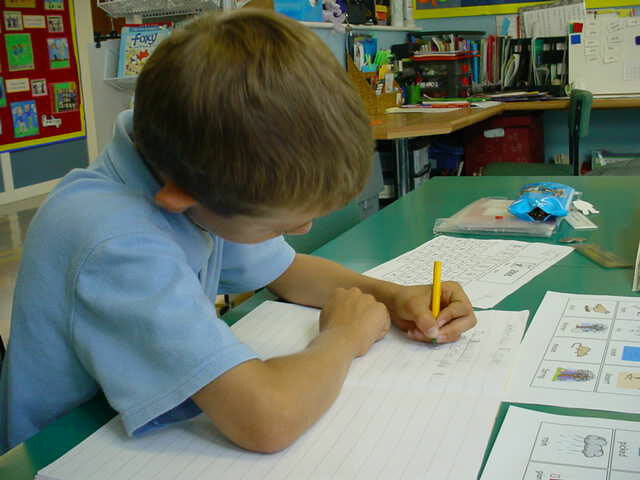 David Y3 had poor language and communication skills and he found it difficult to express his ideas. His writing target, to put a capital letter at the beginning of a sentence and a full stop at the end, was also symbolised so it could be referred to and he could see it - another visual prompt. 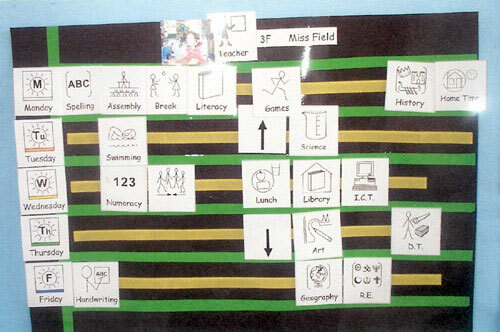 Visual timetables enable pupils to understand what is happening. Understanding the structure of the day may diffuse tension. 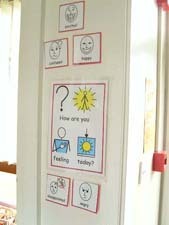 A Y1 child with language and communication difficulties used to find the routine of the day difficult, especially tidying up at the end of session and moving on to the next activity. Since having the visual timetable for the whole class he can now point to the symbol and say this has finished and we're moving on to the next activity. He now seems much more settled into the routine as a result. A YR child had a target to sit still during carpet time. 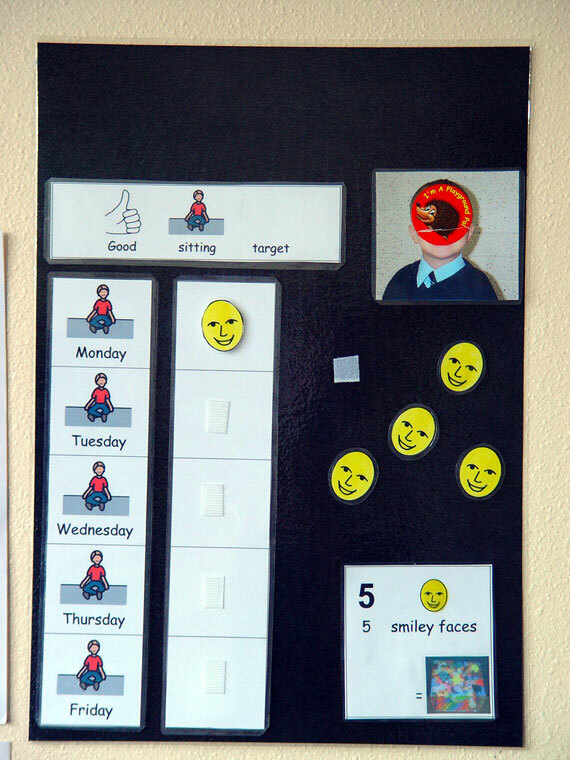 Having this visual prompt kept the child motivated because he was able to place his own smiley face sticker on the board when he sat appropriately. He was able to receive his reward when he had achieved five smiley face stickers. He started monitoring his own behaviour. This was made to use with a Year 5 pupil who would often become very angry and physically violent in the playground and classroom. All staff used these steps consistently and it shortened the time it took for the incident to be dealt with and for the pupil to calm down. The pupil also knew exactly 'what' would happen if he behaved in such a way. Y3 pupil was finding it difficult to eat her school dinner. She ate very slowly due to dyspraxic problems and wanted to leave the dining hall with her friends when they finished. 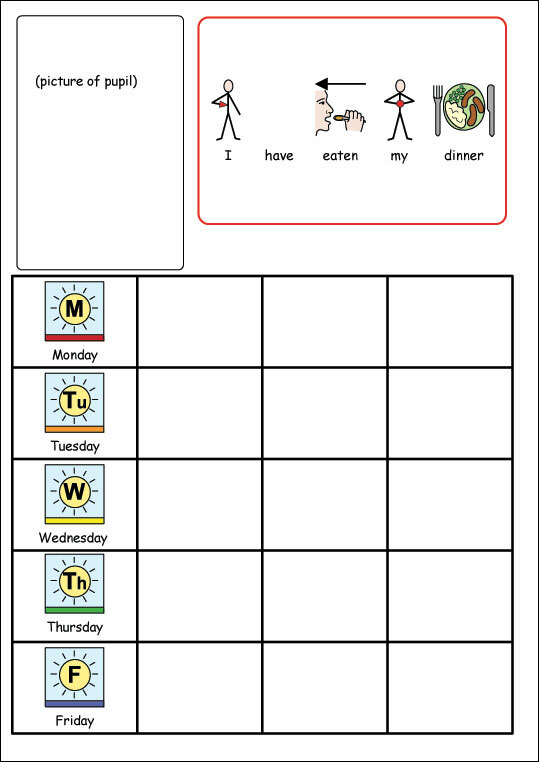 Staff made a reward sheet using symbols and a photograph so that she could have a sticker every time she finished all her food. This really encouraged her to eat more. At the end of a three week period she took the sheet home. Her friend was also given a sticker as this meant she would wait as well. Lunchtime staff supervised this and it worked well. Differentiating the curriculum using symbol supported materials can help to reduce anxiety if a pupils finds learning difficult. Having a visual clue for key vocabulary can really help pupils who have problems remembering word meanings and understanding concepts. 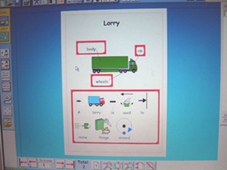 In Print has been used to give Year 1 pupils key information about a lorry and it's function. 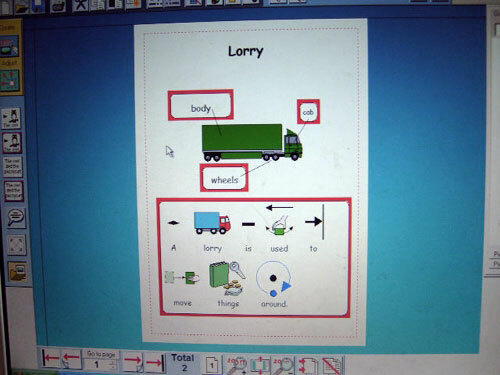 This was one of a number of screens on vehicles that were prepared for a whole class introduction on transport. Pupils and adults are able to add to the information or change it round by touching the screen. The programme works very well interactively and is an exciting way of successfully differentiating information. 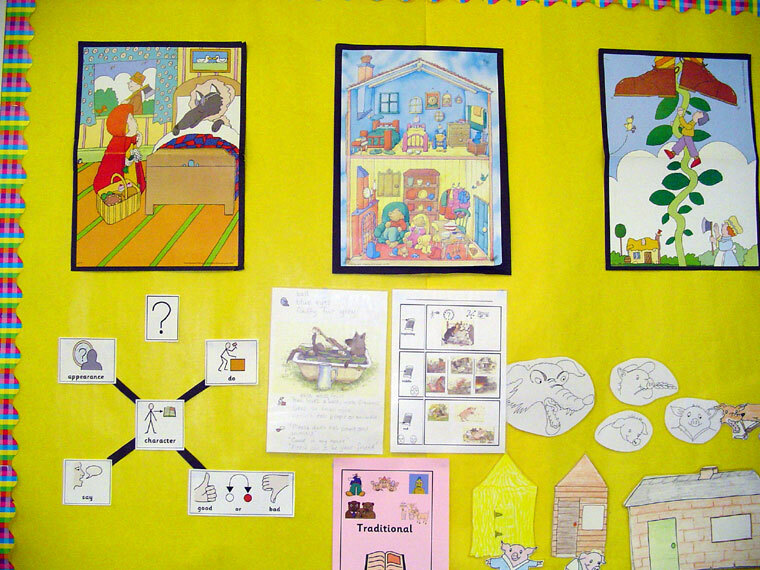 This display shows a combination of three different methods of visual representation to support learning. 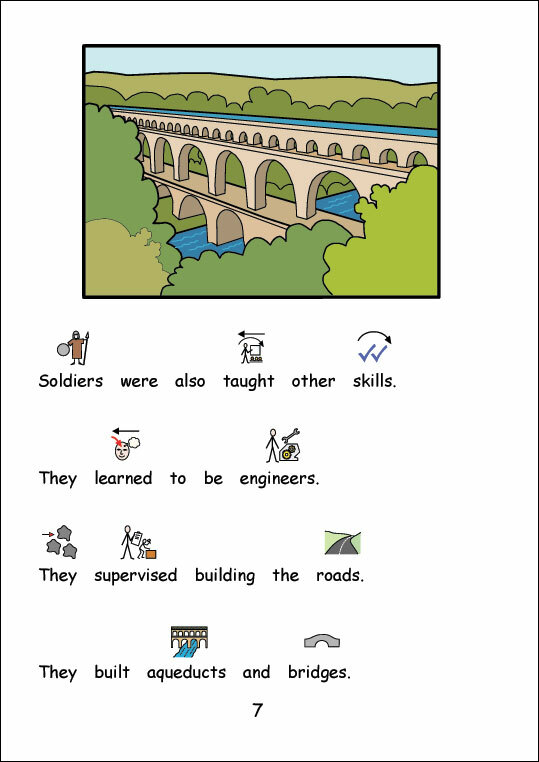 The topic is Traditional Tales which is symbolised at the bottom using graphics and symbols. The display is a 'working wall' which pupils will refer to when writing their own traditional stories. The character 'web' on the left hand side gives pupils ideas about attributes their character may have - appearance, what they do, what they say and if they are good or bad. The story 'writing' frame in the middle has ideas for the beginning, middle and end of the story. There are also pictures of familiar stories at the top and some line drawings of The Three Pigs at the bottom. 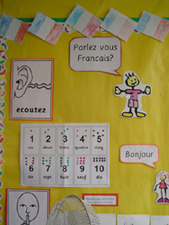 The visual impact of the display encourages struggling learners and increases motivation and self esteem. 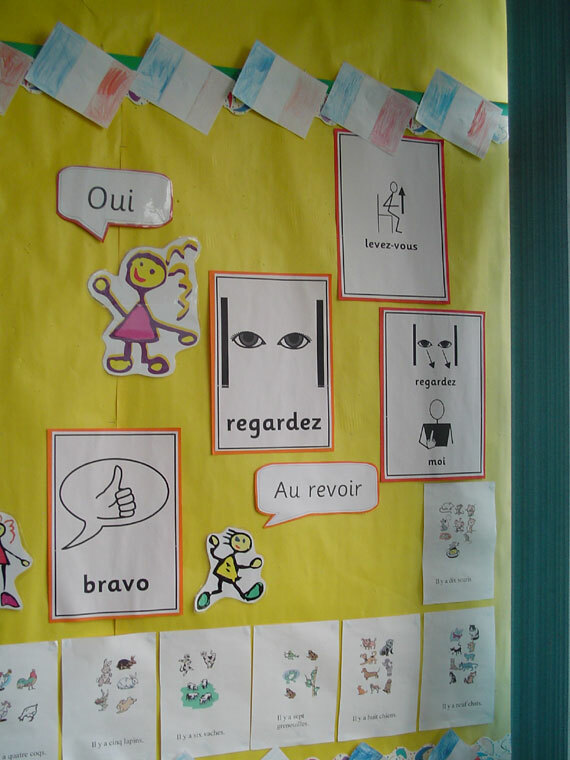 The class teacher has used the symbols from In Print to help pupils understand the meaning of some French vocabulary. This really helped them to remember what the words meant. 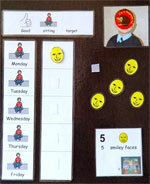 The teacher said that using symbols was a very successful way to aid understanding for all pupils in the class. 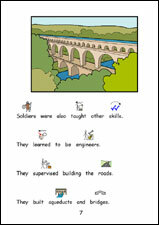 Information books on the Romans with four different levels of symbolisation and a text version allow pupils to access information at a level appropriate to their needs. 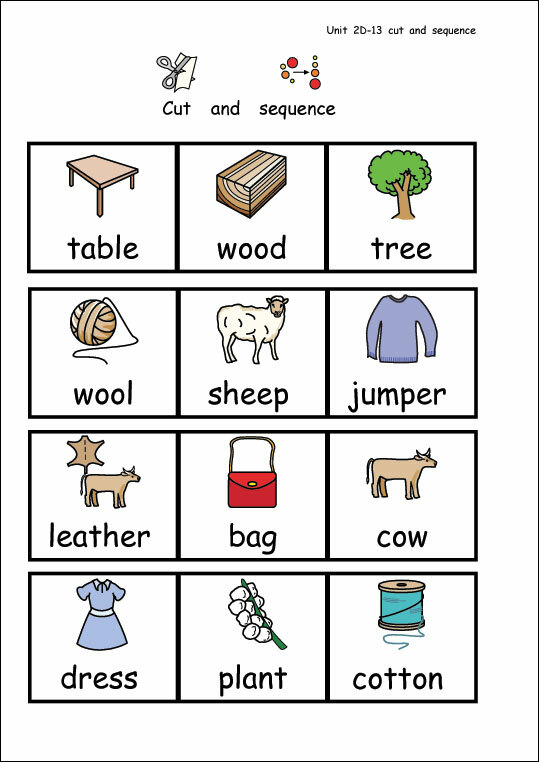 This material gives teachers instant differentiated resources and the symbols provide visual clues for new and key vocabulary. Key Stage 1 Science resources on Materials. An activity to cut and sequence to reinforce where certain materials come from. 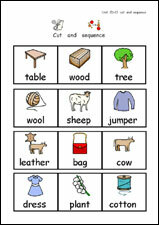 The symbols allow pupils who find reading and understanding text to work more independently. Year 3 Science - Magnets and Springs. 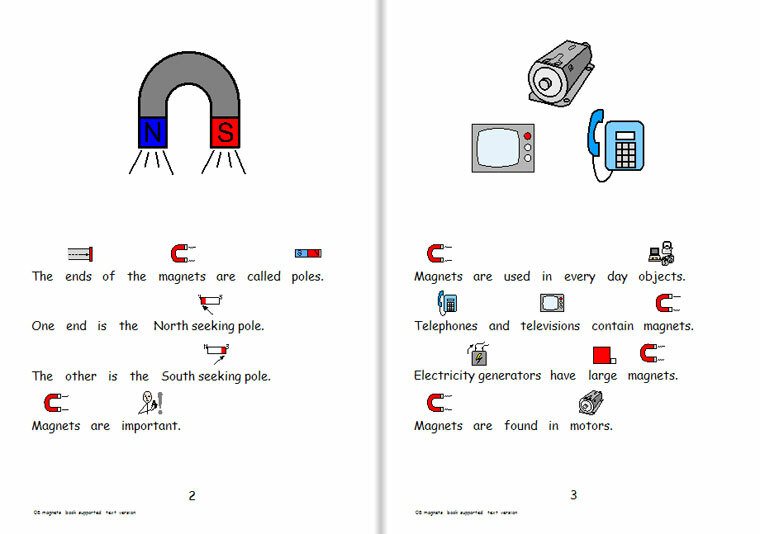 An information book with symbols supporting key words. 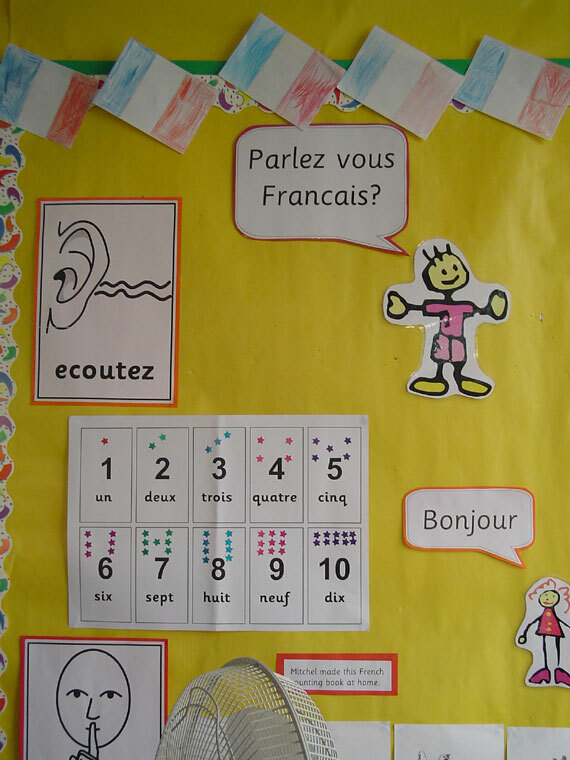 Pupils gain confidence and self esteem from having information presented in this way. They are also able to link the symbol with the word meaning and this helps with retention of the information. Social Groups improve independence and confidence enabling pupils to feel positive about themselves. 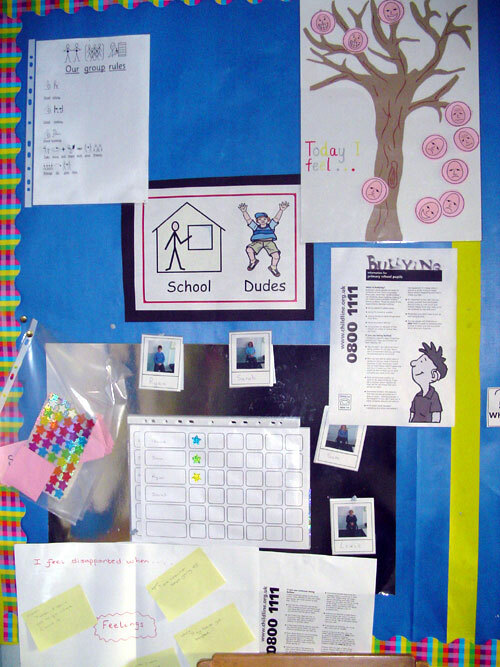 A Year 5 Social Group called the School Dudes used symbol support for the group rules. This gave an easily accessible reminder during the sessions that could be referred to. The rules encouraged listening to others, being kind, good sitting and looking at the speaker. The group was also encouraged to talk about how they were feeling. The photo on the right shows how symbols can be used to help express feelings. Pupils can point to the symbol which best matches their mood if they are unable to express the feeling verbally. 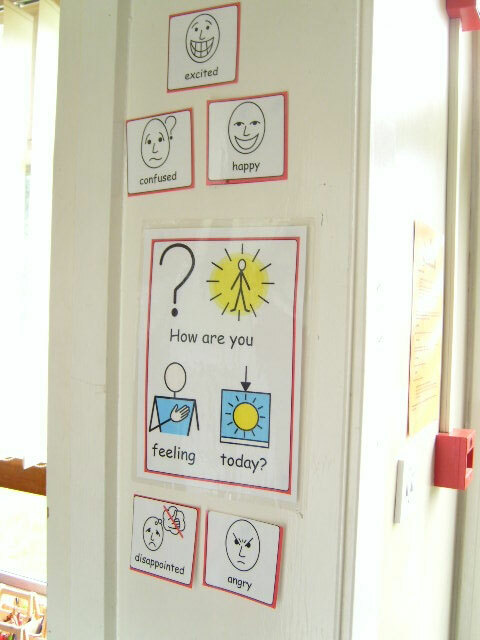 Encouraging pupils to express feelings using the symbols as prompts.